The US has unveiled the first multicoloured dollar bill - a peach, green and blue $20 note designed to thwart counterfeiters. The note, which will be issued in the autumn, also features two new "symbols of freedom" - a blue eagle in the background, and a metallic green eagle and shield to the right of the traditional portrait of Andrew Jackson, the seventh US president. Tom Ferguson, director of the Bureau of Engraving and Printing, the agency which produces dollar notes and coins, said forgers would find it more difficult to reproduce the new design. "This is the new colour of money. It is safer because it is easier to check, smarter to stay ahead of tech-savvy counterfeiters, and more secure than ever." 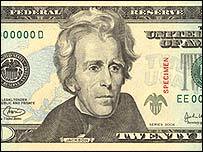 The new $20 bill breaks with the US tradition of producing dollar notes to a uniform size and colour across all denominations. It comes in response to signs that counterfeiters are becoming increasingly sophisticated. According to the US Secret Service, about 40% of the forged dollar bills detected last year had been digitally produced, up from less than 1% in 1995. "US currency is a worldwide symbol of security and integrity. This new design will help us keep it that way by protecting against counterfeiting and making it easier for people to confirm the authenticity of their hard-earned money," said US Treasury Secretary John Snow. The US Treasury is also planning to issue re-designed $50 and $100 bills, although these will not be distributed until 2004 and 2005. The original notes will remain legal tender even after the new designs are in circulation.